Where to next for Piet? Ladies and Gentlemen, boys and girls, men, women and anything in between on the jury, it is my very warm pleasure to be writing here today on a subject that is dear to my heart and its associated cockles: Zwarte Piet. 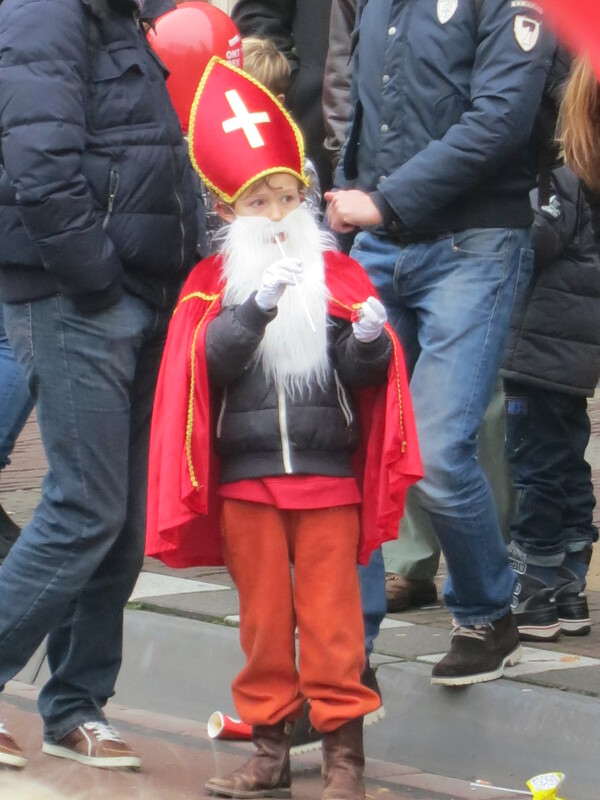 Although others have both mentioned this Dutch peculiarity in the wider context of the Sinterklass festival, I feel little has been done to truly acknowledge Zwarte Piet, and his amazing uniqueness among Christmas traditions worldwide. This character, which in our Anglo-American Christmas tradition comprises a series of ‘elves’, helps out Sinterklaas, a.k.a. ‘Sint Nikolaas’, ‘Father Christmas’ (‘Santa’ for Americans) with the apparently arduous task of giving out sweets and gifts to Lord-abiding children. He dresses like a harlequin, plays music, sometimes hugs and takes photos with kids and causes more public myrrhth and merriment in Holland that an octogenarian on a horse could stir up in thousands of years… trust him, he’s tried. Piet’s funny, he’s happy, he’s likeable, he does Gangnam style, just about everything you’d want in a Christmas character. 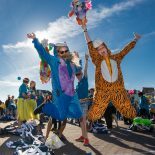 It is no wonder then, that a group of activists, otherwise known as massive Dutch party-poopers, were arrested last year for campaigning against Piet. Christmas is a time of sharing, we know, but those kind of opinions can wait for February at least. “OK Eric”, you say, “We know about elves or whoever this Dutch Piet character is. We know that Santa couldn’t do all the work by himself. Why should we care? I mean, have you seen all the kids around these days? They’re freakin’ everywhere! And jolly old St. Nick’s not getting any younger either… for the love of God, let him have his helpers! We would offer to give him a hand ourselves for heaven’s sake, but we’re too busy shopping. Look, as long as they’re good, solid workers, and they abide by the relevant health and safety regulations, let them go for their lives! Who are we to stop Piet from doing his thing? Nobodies we say! Nobodies at all!”. But if you’ll kindly excuse the pun (you may not) my friends, there is indeed a much darker side to this story, and one which outrages International Students in Leiden, Dutch liberals, and people all over the world. The problem is less about Zwarte Piet’s function, but about his appearance. Shortly put, he resembles a vaudevillian blackface character, completely covered on hands and face with makeup to resemble the complexion of an ethnic West African, which the legend implies, is his racial background. In the streets of Leiden, about a hundred Piets lined up to enjoy and participate in the parade of Sinterklaas, including marching band made up of Piets, Piets climbing on signposts, and sundry other Piets. The festival is massive and awesome, bizarre and unique. Continuing the tradition, children are decked out in Piet gear, many also wearing blackface makeup. This outrages some, and is clearly a perfectly acceptable norm for others. That the streets are so full with people celebrating is a clear sign that the case against Piet strangely has few active supporters. Those who dress as Piet certainly have no qualms, I even got a photo with a Piet, he was almost as happy as I was! But there are serious questions for Dutch society in all this. Does it send the wrong message about race relations? Is Piet a ‘subordinate’ that enables racial generalisations? It is not easy to quantify or qualify Piet’s impact on racial perceptions in Dutch society, but the government seem to think it’s a good idea. As mentioned, arrests for protesting against Zwarte Piet have been made, an indication that it’s all good in The Hague. All I know and all I saw was people having fun and being silly. If someone saw anything else, please contact me immediately. smart casual; good option son. At the end of the carnival the participants doubtlessly go back to their showers, and drains across the city surely fill with endless quantities of dark facepaint. Plumbers probably do very well from Sinterklaas indeed. But while they lather up, do the Dutch wonder about the meaning of all this? Probably not. They’re probably too full of pepernoten or worse, dreaming about next year’s hijinx already. The next day, Leiden will be the same wonderful city that has thrown up another bizarre question for cross-culturalists far and wide. I don’t know exactly how to put it, but there is a certain and undeniable charm in these antiquated ceremonies, as offensive as they may be to our (hypersensitive) modern worldview. Part of me wants to say it is wrong, part of me wants to say it is right, and part of me just wants to get my Christmas shopping done. Piet’s origins are certainly not ‘out of Africa’, but very European. Piet was originally a chtonic earth-spirit and European folk-lore has lots of dark/black characters that are mischieveous and somewhat dangerous, such as pooka’s, and black-faced misschief making traditions (such as the Border morris dancers or the old ‘Sunderklaas’ tradition on the islands of Ameland, Texel and Terschelling which includes fancy dress, making yourself unrecogniseable with blackface and rumbling voice). 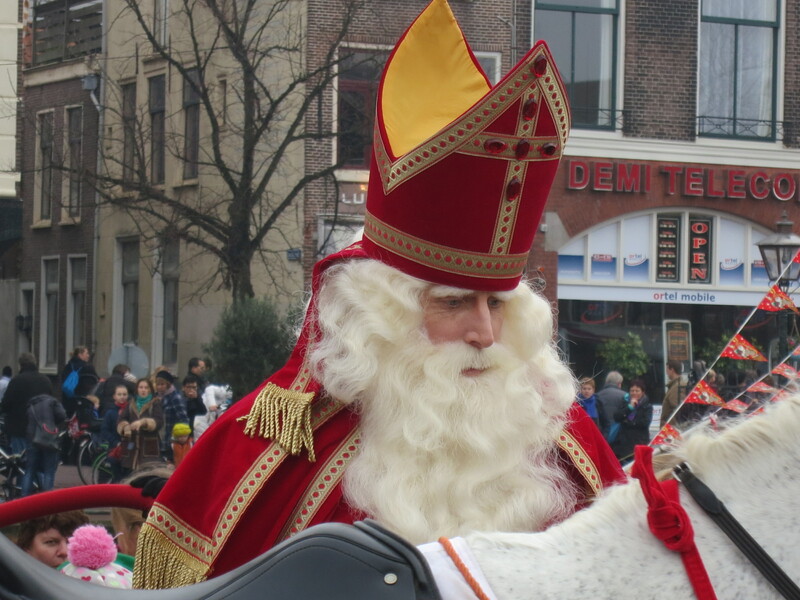 Just as St Nicholas himself, Piets origins go possibly back to pre-christian times, when the Germanic god Odin rode the rooftops on his white-gray horse Sleipnir and sent his black ravens Huginn and Muninn to listen at the chimneys to find out if the people within had been well-behaved. But this is not all; since Piet has recognisable ‘Lord of Misrule’ roots, there might have been some cross-pollination with the Roman Saturnalia feast. The Saturnalia was held in december as well and had, just as the Sinterklaas feast, traditions of private gift-giving, mocking free speech (think of the rhymes accompanying Sinterklaas gifts), mask-wearing (‘guising’) and general topsy-turviness. And what about that other GrecoRoman december feast, the one of the blackface goddess-of-fertility Demeter? Zwarte Piet is associated with fertility after all, always carrying that symbol of fertility, a switch made of birch twigs. When the low countries were christianized the old gods became either christian saints or demons, or, as was the case with Sint and Piet, both. Odin became St Nicholas and ‘Black Pete’ appeared in old woodcuts as the devil/demon, a symbol of the demonized old religion that had been conquered by the new christian saint. This idea still lives in Alpine regions, where St Nicholas is celebrated as well. There, St Nick’s companion is Krampus, a fearsome devil (look him up in wikipedia). In Germany, St Nicholas is helped by Knecht Ruprecht, whose face is darkened with soot and in France St Nick is followed by a black-clad and hooded evil butcher who was forever condemned to follow St. Nicolas as a punishment for luring the little lost children into his shop. In Czech and Slovak tradition it’s the devil again who accompanies St Nicholas and in Switzerland it’s Schmutzli, whose face is darkened with lard and soot. In the nineteenth century, folk traditions and fairytales became standarised and were sanitized almost out of recognition. Anything that smacked of possible hankypanky or pagan origins had to be polished and explained away and Piet was consequently labeled a ‘moor’ by the schoolteacher Schenkman in much the same way that Clement Clarke Moore turned Sinterklaas into Santa Clause with a ‘little round belly’ that ‘shook when he laughed like a bowl full of jelly’. Despite Schenkman’s busybodying, there isn’t a Dutch child (of whatever colour) that would think that Zwarte Piet was black because of his race or ethnicity. Nor are the people who portray him ridiculing any race or ethnicity. Zwarte Piet doesn’t HAVE a race or ethnicity. Zwarte Piet is Zwarte Piet. Point is, people have used blackface for other reasons than mockery of African American stereotypes, and they have done so for centuries, if not millennia. Blackface had connectations to ‘earth’/chtonic gods. It was used to disguise oneself and make oneself unrecognisable and so free oneself to take on the personality of a misschieveous trickster and benevolent sprite. Blackface has also been used, the past 150 years, to cement and prolifirate certain racist images, the most notable were the infamous blackfaced minstrels. 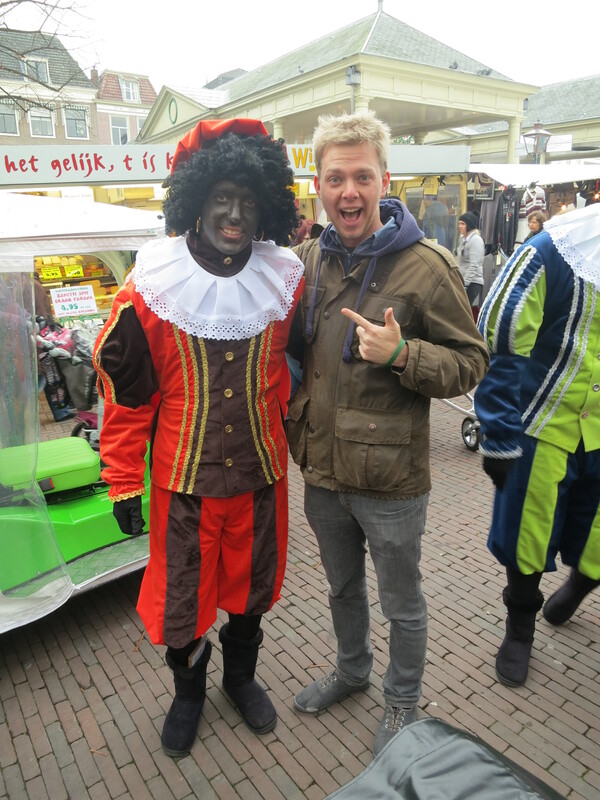 To compare Zwarte Piet to blackfaced minstrels, however, and call him racist is both ignorant and insulting. Zwarte Piet has gone through many a transformation in the past 2000 years. Piet might once have been a raven of the gods, a fertility goddess, a demon, a bogeyman, a moor and soot-besmirched lord of misrule, and he no doubt will, one day, change again to who knows what. But whatever shape Zwarte Piet might take, he will always be Zwart. Hi Marion, this is excellent feedback and I’m really glad you took the time to post it! 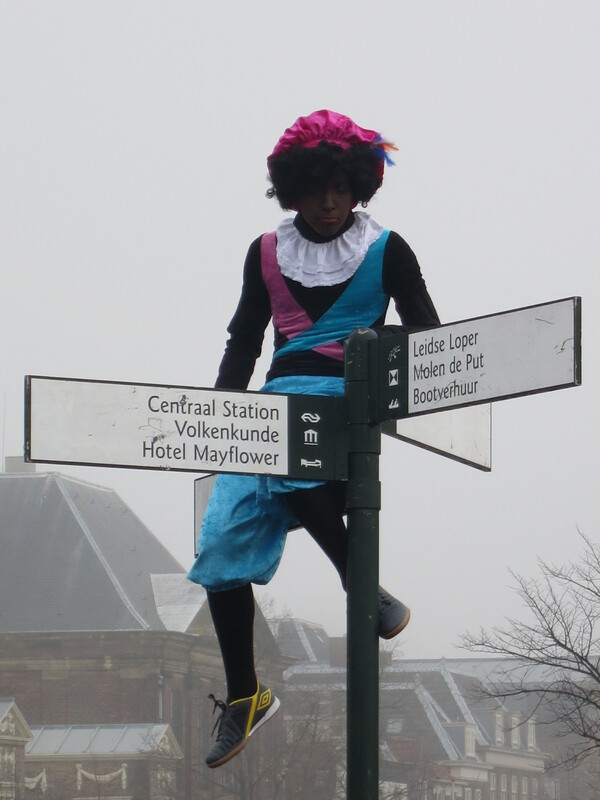 Zwarte Piet is certainly a very confusing character for anyone who has grown up outside of Dutch society. I am therefore glad you have been able to shed some light on it from an insider’s perspective. That the world is littered with such cross-cultural misunderstandings is a subject that personally fascinates me, but to which I’m sure there are no concrete answers. Even in an era where information is so abundantly available, many people clearly still hold on to prejudices and re-appropriate ideas from bygone eras that may or may not be entirely politically correct in our contemporary world. Often, it seems, in the timeless struggle between reality and fiction, fiction often gains the upper hand, and what your analysis shows so agreeably is that ‘explaining away’ those aspects of a cultural heritage that do not entirely match the Zeitgeist is neither functional or historically rational. Thanks again so much for your fascinating post! Thanks Marion, being Dutch and very much interested in Sinterklaas and it’s background, even I got new information out of your post! Also thank you Eric, for taking the time and effort to try to explain and understand is complex tradition! I very well understand the weird feeling people may have, especially those comming from an Anglo-Saxon tradition where black-facing in de early 20th century had a very significant racial aspect. All de different explanations here in The Netherlands don’t make it easier and even more: Marion’s extensive background knowledge in not common among all who celebrate Sinterklaas. This makes it hard for many (Dutch) to develop a explicit concept of Zwarte Piet beyond the intuitive: ‘he is Zwarte Piet’. If it’s up to me, please, lets keep this tradition alive. This entry was posted on November 25, 2012 by admin@theleidener in Living in Holland and tagged Black Pete, children, Eric, festival, fun, Holidays, international students, leiden, Leidener, racial, racist, Sinterklaas, Winter, Zwarte Piet.